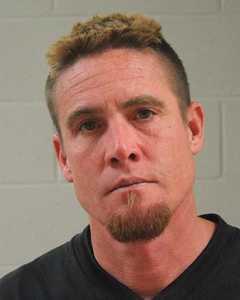 WASHINGTON COUNTY – A 42-year-old man, who was arrested three times in March and was already incarcerated, is facing additional burglary, theft and criminal mischief charges for breaking into another man’s shed, helping himself to the man’s belongings and then pawning the items in March. The new charges were filed Sunday. Deputies met with a Washington County resident on April 13, regarding a locked storage shed on his property at his second home in Veyo that had been broken into and had items stolen from it, according to a probable cause statement written by Washington County Sheriff’s Deputy Judy Randall in support of the arrest. The perpetrator allegedly broke one of the shed windows and used a sawhorse to climb through the window before leaving with a saddle, valued at $450, and a Mercury 25XT outboard motor, valued at $2,000, Randall said in the statement of probable cause. When deputies ran a pawned property search, they located the saddle and motor at Family Pawn in St. George, the statement said. They discovered the items had been pawned on March 6 by Jerimy Jeff Chadburn, of Veyo. Chadburn was already incarcerated in the Washington County Purgatory Correctional Facility for numerous charges, including stealing $9,000 from a deceased man’s bank account which he shared with his 79-year-old mother. He is now facing additional third-degree charges for burglary and theft, as well as a class B misdemeanor charge for criminal mischief, adding $10,680 to his bail. Chadburn’s next court appearance for these charges is scheduled for April 27. 42 years old and he still hasn’t figured out how to support himself without stealing. Loser.